The way the US treats prisoners is often barbaric. The UN has repeatedly highlighted how solitary confinement is a form of torture that should be stopped, but the US regularly uses it on its massive prison population (largest prison population in the world! Go USA!). And even if you don’t think it’s torture, you should at least recognize that people are thrown in solitary confinement for ridiculous reasons — such as looking at Facebook. Or, apparently, having expired toothpaste in your cell. It appears that Chelsea Manning is now facing indefinite solitary confinment for a short list of “infractions” which include having expired toothpaste (“medicine misuse”) and having a copy of the Caitlyn Jenner issue of Vanity Fair, along with some other magazines (“prohibited property”). The other two charges may seem slightly less crazy, but not when you look at the details. 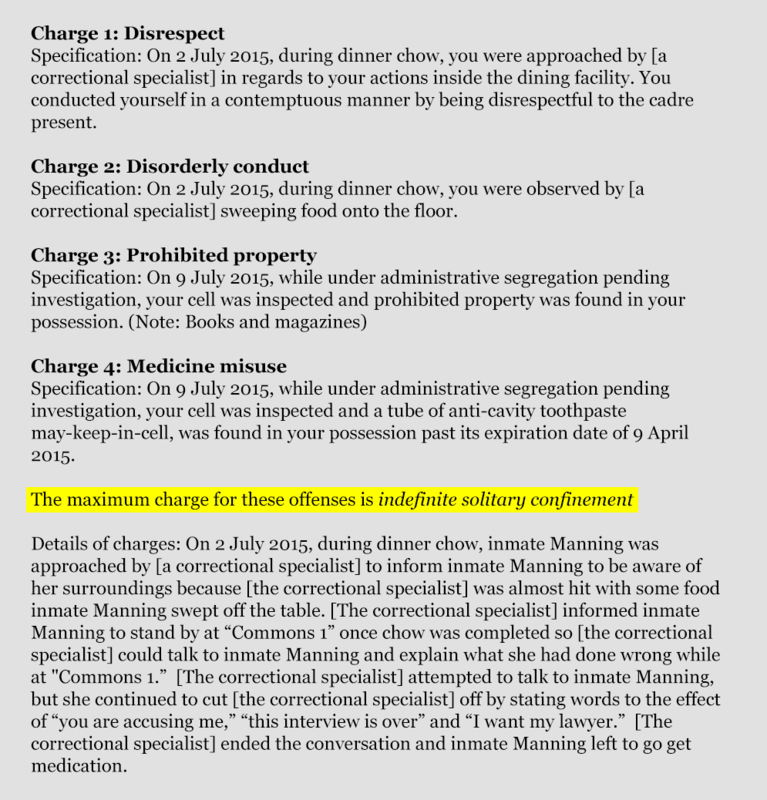 They are for “disrespect” and “disorderly conduct,” but the “disorderly conduct” was for apparently sweeping some food on the floor during a dinner, and the “disorderly conduct” was for asking for a lawyer when Manning was being yelled at over the food incident. There’s a hearing about this on August 18th, and Fight for the Future has set up a petition about this to call more attention to the way Manning has been treated. As the petition says, it’s clear that Manning is being “singled out and punished for speaking out.” Even if you don’t think Manning’s actions in leaking State Department cables was just, hopefully you can recognize that indefinite solitary confinement over such minor charges is ridiculous.